We’re pretty low-key party people here. We’ve got four kids and if I went overboard, I’d have to do it for each of them and I don’t have the money or the mental energy for that, you know? So we try to do things at home, or take just a few friends out for a special event. If you are staying home, try cookie dipping for a fun activity. And bonus — it acts as both an activity to keep kids entertained, and as a tasty snack when you’re finished! 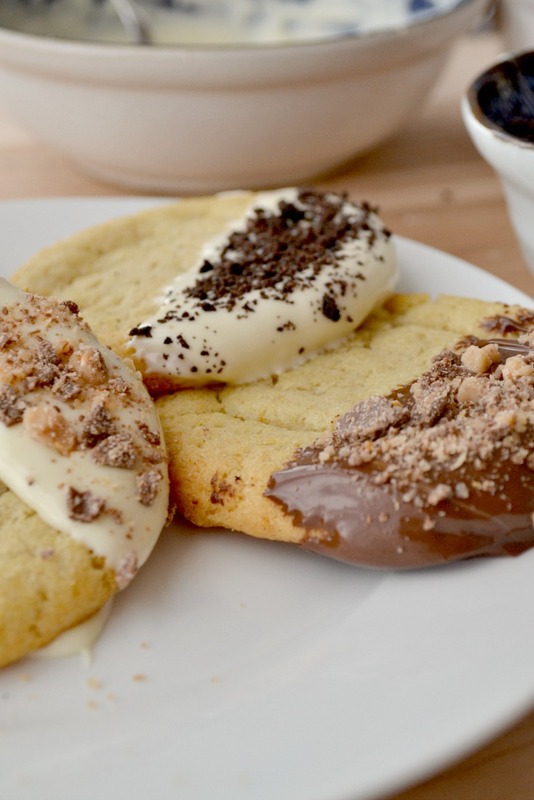 If only everything in your life multi-tasked like these cookies. The concept is pretty simple — have a few different kinds of chocolate for dipping, and some toppers to sprinkle on. 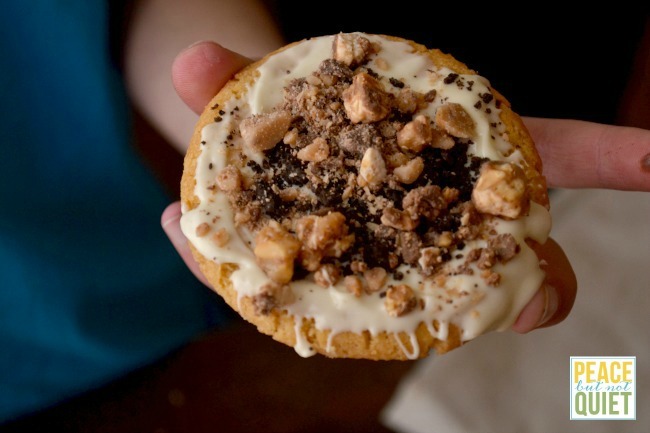 Crushed candies are always a hit — at Christmas I’d do crushed candy canes and white chocolate. Or chopped up candy bars (we used Snickers and Heath bars above). 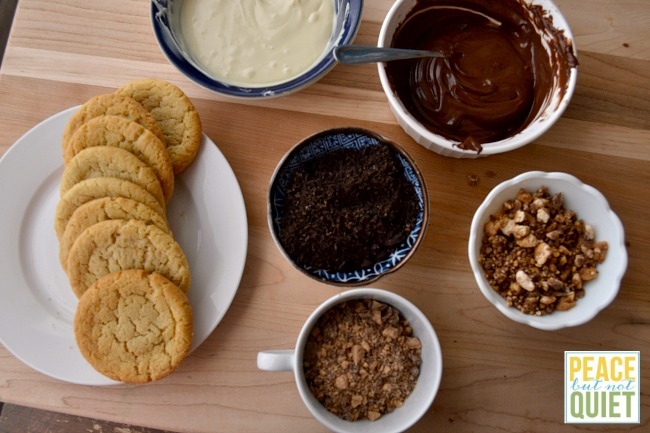 Even other kinds of crushed cookies — cookies dipped in chocolate and Oreo crumbs? Yeahhhhhhh. Sprinkles are good, too. The trick is getting the kids to leave them alone long enough to allow the chocolate to harden…although if you want to let them eat the cookies right away, I ain’t stopping you. Life is short. Carpe diem and eat your cookies. Put each kind of chocolate in a microwave-safe bowl. Microwave for 15-second increments, stirring in between, until chocolate is melted and smooth. Put candies and other toppers in small shallow bowls for easy sprinkling. 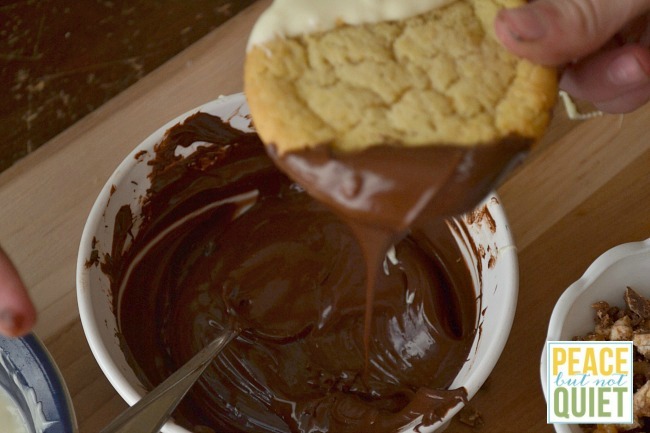 Take your cookie and dip it in the chocolate of your choice. Or both, if you’re partial to black & white cookies. Sprinkle on your toppings of choice. Set cookies on a piece of parchment or waxed paper and allow chocolate to harden for about 15-20 minutes. Serve and gobble ’em up! If you’re having birthday cake or other treats and you don’t want to overload on the sugar, you can also put the cookies in parchment bags to send home with the kids as party favors. Their parents will love you for this, and for the resulting sugar high you’ve given their children, and they may call you at 2am to express their undying thanks and gratitude. All of this is what makes parenting fun, yes?